With the rise and growth of the VOD market, children’s TV is expanding in new areas as VOD suppliers such as Netflix and Amazon Prime recently announce new investment in programming for young people. This is good news for producers of children’s programmes, especially for independent production companies. Working in children’s TV is much like working on studio shoots in; dramas, sitcoms or soaps - they share the same production processes and all work to a commissioned script and set schedules. Some children’s content is more fact-based (eg. science, nature, maths), or will have documentary elements, in which case, production will still work to scripts, but the editorial staff will need to have Research skills - for fact-finding. If you wished to pursue a career in children’s TV, you would usually start out as a studio runner or Office Runner at an independent production company specialising in children’s TV, or a broadcaster with in-house studio facilities. After 6 to 12 months in the runner position - you may decide to go into editorial where you would start as a junior researcher - finding contributors to take part in programmes, finding stories, and assisting on shoots. You may get the opportunity to present on camera - children’s TV is a renowned for being a testing ground for many now famous presenters (eg. Phillip Schofield, Anthea Turner, Fearne Cotton). Another route would be to become an assistant floor manager, then a floor manager - if you really enjoy the studio environment. A career in children’s TV would complement other genres such as: news, factual, drama, comedy and entertainment. TV Dramas range significantly in terms of budget, which dictates the size of the crew that are employed and resources available for the production. Working in Drama is much like working on a feature film, though TV budgets are usually smaller, unless it’s a lavish global co-production like the BBC’s ‘Versailles’, which cost a whopping £24 million for 10 episodes. Both genres work from a commissioned script, use skilled creative and technical crew to film the action and usually take longer to make than factual content (unless you’re filming the year in the life of an Arctic Fox). Cast and crew can flit quite happily between drama and feature film work, though production departments may be smaller and have more duties on TV productions. People used to working in drama and feature films may also be tempted to dip into music video, comedy and children's TV, especially big budget live action shows such as Horrible Histories or Hank Zipzer. Genres that contrast with drama include: news, documentary, factual, sports and live broadcasts. It’s not impossible to go from a career in drama to a career in live or factual content - but the transition will be steeper and the pace will be different. People who work on live broadcasts (sports, news) have to be sharp, tenacious, and prepared for deadlines and very fast-paced schedules. TV comedy content comes in all sorts of shapes and sizes including; sitcoms, panel shows, stand up, satire and sketch shows. Most of these sub-groups (all except stand up) are produced in a similar way to TV drama - they work from a script, use locations and studio set-ups, run to a set schedule and use a mix of creative, admin, and technical crew to produce programmes. Budgets vary, but generally they have less to play with than drama productions, with lower production values. Stand up shows are produced much more in the vein of entertainment shows - with an audience, and very strict schedule (covering one day - or one evening), where the margin for error is zero. These shows are highly organised and rehearsed in pre-production. Rigging is often tricky if the stand up is taking place in a location rather than a studio which has already been kitted out with sound proofing, stage lighting rigs, green rooms etc. If you start a career in comedy production (eg. as a floor runner on 8 out of 10 Cats Does Countdown), you could transition to big studio sensations such as Strictly Come Dancing and Britain’s Got Talent - as these programmes are all studio productions. You may wish to switch into drama or children’s TV, which have similar working environments - though you’ll probably get to travel more as these types of productions generally use more than one location, as well as some studio set-ups. Factual content includes a vast arena of programmes including; documentary, magazine shows, arts and culture, history, politics, science, nature, travel and talk shows. All factual shows are scripted in one way or another (some scripts are put together in post production, others are loosely scripted in pre-production, then have a separate commentary script written in post production). The difference between drama scripting and factual scripting is that factual content is generated by the Editorial Department, who are generally from a journalistic background - and know how to research real stories. A lot of factual content is presenter or celebrity led. This may include a camera friendly historian or a comedian-turned-adventurer. Budgets for factual content are notoriously low, which means that crew and production staff are given more duties than those working in drama, and crew working in factual often become multi-skilled in order to land a steady stream of contracts. Starting out in factual, you’ll usually be an office runner, junior researcher, logger or location runner. You will learn quickly - often given jobs that would have traditionally been given to researchers or assistant producers, and training will be given on the job, unless you work in-house at a broadcaster such as the BBC, who nurture their talent by sending them on training programmes where possible. People working in Factual also cross over into news, entertainment and children’s TV, where their journalistic skills transfer - and they can thrive in a fast-paced environment, travel to interesting places and adapt to chaotic schedules. Entertainment programmes are generally lighthearted, family-friendly orientated, with a comedy, competition or talent angle. Entertainment encompasses; studio game shows, award shows, variety programmes, talk shows (like So Graham Norton), cars, cookery, and reality TV shows. These are the shows that generally take the biggest ratings, and are given the prime slots in the TV schedules because they have mass appeal and are very watchable/formulaic. Entertainment shows have big budgets, usually drawing in big celebrity presenters and contestants. The formulaic nature of some of the biggest entertainment shows (Strictly, Big Brother, I’m a Celebrity...) means that they have rigid production schedules and crew will usually return year after year because they like the familiarity of working with the same colleagues and on screen talent. If you start out as a floor runner or camera assistant on an entertainment show, you could cross over into factual, sports or children’s TV. Sports broadcasting is big business, with channels regularly caught up in bidding wars to secure the rights to screen premium fixtures and less frequent but very prominent global competitions such as the Olympics and the World Cup. Live events and talk shows, post match analysis and other spin-off content can be fun but frantic to work on. Outside broadcasting (OB) has its challenges, but if you like watching sports, then chances are, you will enjoy working in this environment and having knowledge of sport history/logistics will count in your favour. If you have a background in factual, documentary or news - then you will integrate well in sports production. It would be a lot harder (though not impossible) to transition from a job in drama to a job in sports. News production is an exciting and transient environment to work in. You will have very strict deadlines, and be prepared to change the angle of a story - or find a new story if a contributor pulls out or if an editor has a change of heart. Those who work in news are generally trained journalists, who have come from a regional news or radio background. News budgets have been cut in recent years, so sometimes the presenters self-shoot their own stories, or are accompanied by just one crew member - who will cover filming, sound and lighting. The story subjects can be very diverse and could take you all over the world. It can be very rewarding if you break a really significant story - or source a really amazing contributor. 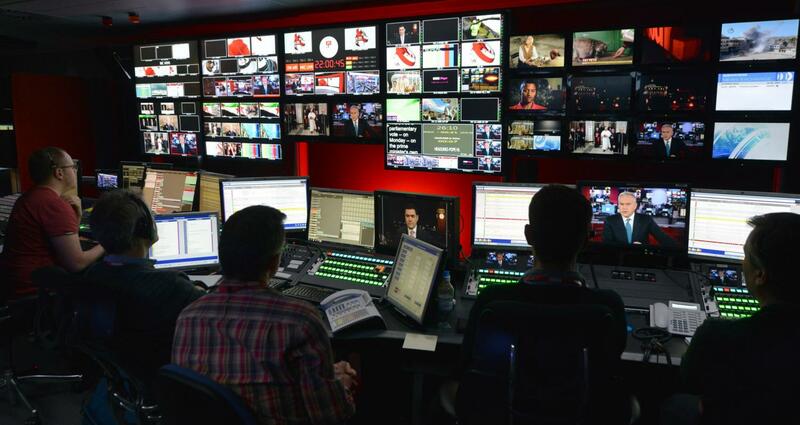 Careers in News compliment other genres such as: documentary, Factual, sport and entertainment - because they all have a ‘live’ or unpredictable factor which means that no two days are ever the same. Music TV is not as big an industry as it used to be, but with the advent of digital channels - the big players such as MTV, Viva, 4Music have a good range of output including music videos and studio talk shows. The music TV studio environment is similar to entertainment, comedy and children’s TV productions - only with a higher importance given to sound recording if there’s a band performing. Music TV studios probably won’t employ as many crew as other studio genres, or be hosted by as higher profile presenters as the big entertainment shows. However, music TV may be a good place to start out, and test the waters to see if you like the studio environment. It could be a good place to learn the ropes in the production department, starting as a floor runner, then eventually moving up to a floor manager. Big global player Netflix has had a virtually unprecedented string of critical and commercial successes with the likes of Jessica Jones, House of Cards, Orange is the New Black, and more in recent years. In 2016 Netflix will spend $5 billion on non-sports original content, and Time Warner, Fox and Viacom follow close behind in the spending stakes. These slick, exciting and bold productions have budgets to rival feature films (we’re talking approx $4 million per episode! ), far exceeding production budgets spent on typical TV equivalents in the UK. The biggest VOD service providers Amazon Prime, Netflix, and Hulu (and production companies they commission content from) are usually based in America - although Amazon poached Jeremy Clarkson and his former Top Gear chronies for a new car show called The Grand Tour. The original content is commissioned much like any other content - though some programmes may end up being long running series if they rate well initially. The productions will involve massive teams of creatives, administrators and technical crew - on a par with the size of crews employed on feature films. Commercial Digital Channels such as Sky Atlantic have also upped their commissioning quota of original TV content in recent years - and will often encourage European co-productions, or work directly with UK producers.